Christian Audigier’s online store is having a 30% off sale on all their hoodies! Its rare to see such a discount from Christian Audigier on their most popular item.. the hoodie. Times are tough though, and everyone’s gotta do what they gotta do to make the sale. 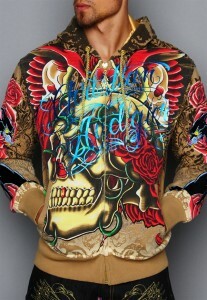 The sale ends on May 10th, so hurry if you are interested in picking up one of Christian Audigier’s luxury Streetwear hoodies. Keep a lookout for tons of other Ed Hardy and Christian Audigier sales as they are sure to come up. However, even with the Trendy look of Ed Hardy and many out there that call the designs Gaudy and Overly Trendy, google trends shows improved interest over the sale time last year. This entry was posted on Friday, May 8th, 2009 at 7:12 am	and is filed under Fashion. You can follow any responses to this entry through the RSS 2.0 feed. You can leave a response, or trackback from your own site.